Set between Zambia and Zimbabwe, Victoria Falls is the largest and perhaps the most beautiful Falls in the world. 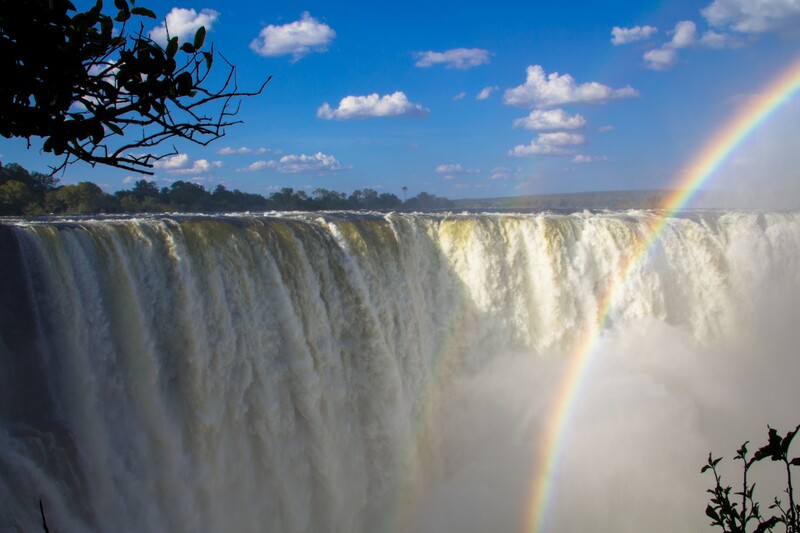 Here the Zambezi River is over a mile wide and plunges into a vertical abyss across its entire width, with the force of the falling water sends spray clouds high into the air – giving rise to the African name, “Mosi oa Tunya,” or the smoke that thunders. In recent years the Falls have become busier than ever, and there is plenty to do and see – here are the highlights. 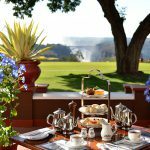 The Falls themselves are a true wonder to behold, and many of our clients opt to visit them as part of a guided ‘Insider’s Victoria Falls’ tour. Stroll through rainforest along the first gorge, a route that makes for a magnificent natural observation gallery with 16 viewing points. Enjoy the panoramic views of the entire “curtain of falling water”, and learn the fascinating history behind the 650 ft (198m) Victoria Falls Bridge, a feat of engineering that was completed in 1905. Tip: If you’re planning to visit on your own, we recommend visiting in the afternoon from May to September. Not only is it quieter than in the morning, but you’ll see more rainbows. From October to December, try to visit at sunrise as the early morning mist takes on an incredible golden hue. Tip: If you’re lucky enough to visit during full moon, it’s worth returning at night to try and spot a lunar rainbow. Next up, a visit to the Elephant Walk Shopping and Artists’ Village, run by a collective to promote local artists. There’s a small museum where you can learn about Zimbabwe’s indigenous ethnic groups, and stores include Prime Art Gallery, which has works by the world-renowned sculptor Dominic Benhura, and The Ndau Collection workshop, where artisans create custom-made jewellery, crocodile-skin handbags and organic fragrances. If there’s time you can go on a tour of Chinotimba Township, where the vast majority of local residents live. This is followed by lunch at Dean’s Victoria Falls, located at Elephant Walk – if you’re lucky you’ll be treated to a bit of soulful singing by the chef himself. Unfortunately, the very popular Lookout Café sustained extensive fire damage recently, but is already in the process of being re-built. For something fun and a little different, learn how to make a traditional potjiekos, followed by a gentle journey down the Zambezi on a raft float or a game-viewing drive. A potjie is a cast-iron pot used to make stews over an open fire, and on this fun afternoon activity you’ll make your own under the guidance of a chef – choose from lamb, beef, fish or vegetables and add stock, spices and wine to taste. The little pots are then left to cook while you go on your float or game drive. Return back to camp for a drink by the firepit followed by your potjie, accompanied by a starter, salads and dessert. 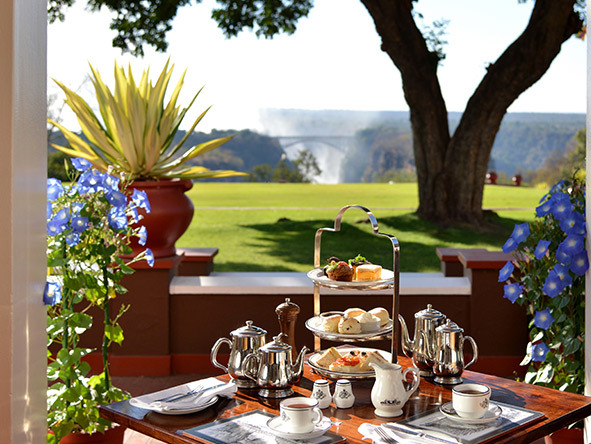 Victoria Falls Hotel has earned international acclaim for its Edwardian elegance and charm, and Stanley’s Terrace serves a very good a la carte lunch or a traditional high tea with sandwiches, scones and cakes – swap the tea for champagne if you like. The grounds are just gorgeous, the lawn is immaculate and you can see the spray of the Falls. Check out some of the communal rooms on the ground floor as they’re a veritable museum of colonial extravagance and a history lesson as well. 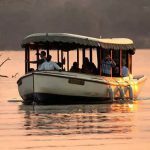 There’s nothing more peaceful than watching the setting sun over the Zambezi with a nice cold beer in hand – or perhaps a G&T – and a sunset cruise is just the way to do it; watch out for wildlife such as hippos, elephants, antelope and giraffe along the way. Seating a maximum of 20 guests, The Victoria is the only luxury safari boat that can access the lower part of the Zambezi River and the body of islands that form the entrance to the Victoria Falls. You’ll be accompanied by a captain/guide and a chef who will prepare gourmet canapes and sushi, and there’s a full bar plus toilet facilities on-board. Transfers will be arranged to and from your hotel – expect to be away for 3 hours in total. This tour begins with a visit to an authentic Ndebele homestead, where you’ll meet Chief Mpisi, a distinguished and charismatic man who loves to talk about the fascinating life he’s led – he’s even met the Queen. You’ll also have the opportunity to purchase a curio or two to support the villagers. Next is a visit to the high-density suburb of Chinotimba, home to 60,000 people. You’ll have the opportunity to visit a local market, tavern and primary school (in term time) as well as an inspiring foster home for abandoned and vulnerable children. It’s not for nothing that Victoria Falls are known as the Adrenalin Capital of the world. 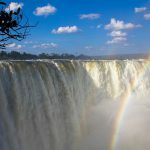 The brave at heart can partake in bungee jumping – the 111 m freefall from the Victoria Falls Bridge makes it the highest in the world – or tandem skydiving, and a helicopter or microlight ride allows you a stunning bird’s eye view of the Falls. The Zambezi is also famous for its Grade 5 rapids. The best time to go white-water rafting is from August to late December, when the water is low. It may be possible to go for a shorter trip from January to March and May to July – you’ll miss the first ten rapids out of 19 as high-water levels make them too dangerous. 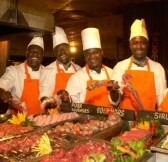 The Boma Restaurant is a classic tourist venue set in the lovely grounds of the Victoria Falls Safari Lodge. Dinner at the Boma is a legendary affair, with what looks like literally hundreds of local dishes served in buffet style, including impala terrine and sadza. A witchdoctor is available to tell your fortune by throwing his bones; dancers entertain with Shona and Ndebele acts; and then … there’s the vat of Mopane worms which are a hoot to try. Yes, it’s touristy, but it’s very well done and a lot of fun. A popular spot is also The Three Monkeys, which serves simple food done well, such as pizza, burgers and salads, all at reasonable prices. It’s open every day of the week, and there’s a great deck for outside dining. If you have an hour or so to spare check out the snake park next door – run primarily as a rehabilitation centre, it’s home to all sorts of venomous African snakes – you’ll get a chance to handle a (non-venomous one) if you like.